This engine intake includes a 180° gooseneck that is designed to prevent ingestion of water. Consideration should be given to engine air intake locations: those that are subject to heavy spray are less than ideal, and if chosen should include a means of water exclusion or separation. I looked at the thermometer attached to the engine’s air inlet filter and raised an eyebrow. It read 117°F (48°C), and it hadn’t stopped climbing. Before looking at it, however, I knew this engineroom was hot—too hot, In addition to my drenched coveralls, many surfaces were simply too hot to touch, including the handrail around the engine. 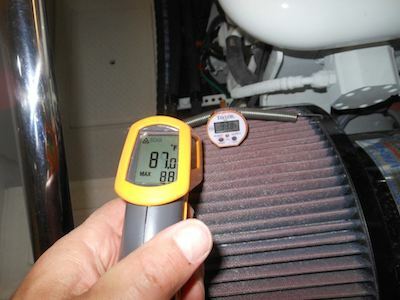 On its own, that temperature reading, while seemingly high, isn’t of much value without knowing the ambient temperature, the temperature of the air outside the boat, or the air that is being drawn into the engineroom for cooling. The difference between these two numbers, often referred to as “delta t,” tells an important story about engineroom ventilation design and efficiency. In short, engines that ingest hot air burn fuel less efficiently than those that ingest cool air. The warmer an engineroom is, the harder it is on the gear and systems housed there; heat equates to accelerated aging, higher failure rates, and greater operating expense. Perhaps of equal importance, the failure of a builder or boatyard to meet engine manufacturer temperature guidelines can result in denial of warranty coverage for the engine or generator. All but the smallest engine and engine room installations will almost certainly require forced ventilation. 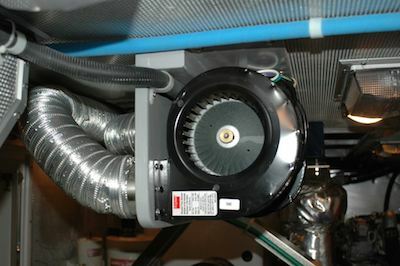 Fans must be rated for continuous duty, like the “squirrel cage” model shown here. Engineroom ventilation falls into two categories, those required for cooling the space, and those needed for combustion. The air used to cool the compartment improves not only the combustion efficiency, but also the longevity and efficiency of gear in this space, including engines, generators, compressors, and electrical and electronic components (and also makes it a more comfortable place to work). Where generators are concerned, while the engine portion is typically liquid cooled, the electrical generation end relies on air from the engineroom for its cooling (a small number of generators rely on liquid cooled stators). When engineroom temperature is excessive, generator manufacturers will often lower the unit’s rated output. Additionally, heat takes a toll on “soft goods” such as generator couplings, belts, motor mounts, torsional vibration dampers, transmission damper plates, hoses, insulation, voltage regulators, and other electrical and electronic components, as well as batteries. Whenever possible, it’s always preferable to locate batteries, particularly the house bank, outside engine compartments. Guidelines for calculating the cooling needs of enginerooms abound, however, as a general rule of thumb, (these apply to wet exhaust engines) to determine the necessary air flow rate, in cubic feet per minute, use this formula (2.75 x hp) – 90. Having said that, it’s wise to defer to requirements established by engine manufacturers, or whichever is greater. For the sake of consistency, and to comply with engine manufacturer guidelines, engine room air temperature should be measured at the engine inlet or filter. Digital probe type thermometers should be used; avoid infrared pyrometers for this measurement as they often yield inaccurate readings. Ideally, the delta t, which should be measured at the engine or generator air inlet or filter, and at the louver where air is drawn into the engineroom from the deck, should not exceed 30°F/16°C. (This varies among manufacturers so, for instance, while Cummins and John Deere specify 30°F, Caterpillar and ISO 8861 call for a maximum delta t of 22.5°F/13°C.) Maximum overall air inlet temperature should not exceed 122°F/50°C. (Again, it varies by manufacturer: Cummins specifies an absolute maximum of 150°F/65°C.) Temperature can be measured in various locations around an engineroom, and can vary widely as a result. Doing so at the engines’ air inlet, however, ensures that engine manufacturer guidelines are being met, and it ensures standardization for record keeping, as well as comparisons with other enginerooms. Combustion air, the air that is required to properly burn fuel consumed by the engine, relies on another series of calculations. Most engine manufacturers specify combustion air requirements, which might call for a given cross section for passive air intake vents, or a cubic foot-per-minute requirement for forced ventilation. Caterpillar’s standard guidelines for forced ventilation call for 2.5 ft3 (.07m3), per horsepower, while one generic rule of thumb for passive combustion air inlet surface area specifies 0.55 in3 (9cm3) per horsepower (including generators). The Cummins guideline for passive vent surface area size uses the following formula, rated engine air intake, specific to each model, in cubic feet per minute, multiplied by 0.272, equals required area in square inches. Failure to follow these formulas is a common violation for new builders, particularly where designs evolve to accommodate larger engines with no changes made to intake size. It’s important to note that the cross section must be measured at its narrowest restriction (and louver area must be subtracted); it’s not unusual to find large louvers that supply air via significantly constricted ductwork. Depending on the engineroom size and space available for ducts, forced ventilation frequently is required to achieve engine manufacturer requirements. Forced ventilation should include both inlet/supply, and exhaust air. In the ideal installation, inlet air will be ducted into the engineroom low, near the sole, and away from heat sources, while exhaust air will be drawn from the top of the space, directly over heat producers such as engines. Duct designs should, however, avoid blowing inlet air directly onto engines in that this causes cool air to rapidly heat and be dispersed around the compartment. The all too common high inlet and high exhaust ventilation arrangement is among the least efficient. 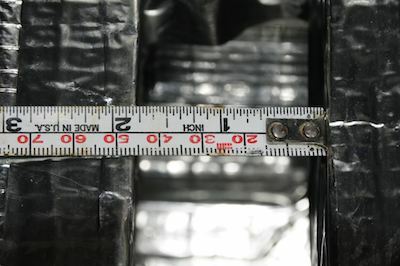 Air inlet openings must be measured at their narrowest restriction, often what begins large on deck, is constricted by the time it enters the engine room. Exhaust airflow should be 110%–120% of inlet airflow. This disparity will take into account thermal expansion, as well as inducing a slight vacuum in the compartment, which in turn will prevent heat and odors from being driven into accommodation spaces. Engineroom vacuum should not exceed 0.5” (8.2cm) H²O. Of course, inlet and exhaust ducting should be located far enough apart to prevent short cycling of air flowing between them. 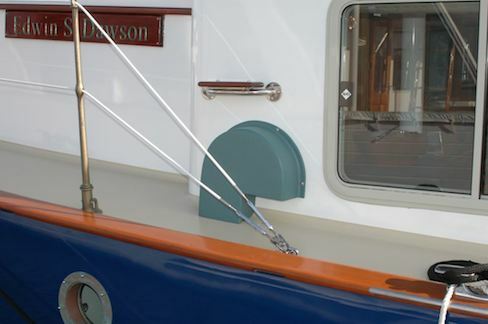 Editor’s note: To learn more about this topic, attend Steve’s presentation Engineroom Ventilation Dos and Don’ts (Session 204) at the International BoatBuilders Exhibition & Conference in Louisville, Kentucky, on September 15, 2015. For more information, visit the IBEX website. About the Author: For many years a full-service yard manager, Steve now works with boat builders and owners and others in the industry as Steve D’Antonio Marine Consulting. He is the technical editor of Professional BoatBuilder, and is writing a book on marine systems, to be published by McGraw-Hill/International Marine.